To kick things off, let’s talk a bit about you. How did you start your private practice? I joined the group I work for, Family Therapy Associates, about a year and a half ago. I work at the St. Croix Falls, WI location. What makes you get up each morning? What makes your job worth it? My clients, they make my job worth it. I get fulfillment out of seeing an individual make progress and appear happier. It is a privilege to know that others trust me with their stories. When we last talked, you mentioned that it’s your responsibility to use the time in therapy sessions as effectively as possible. Can you tell a bit more about that? I want to see clients get better and live better lives. People have a limited amount of time and taking time out of their week every week to go to therapy, it’s not convenient for most people. So they don’t want to be in therapy for a year. You know what I mean? If they could come in, work on their treatment plan, and be done with therapy after 10 sessions, because they’ve worked hard in session and they’ve been implementing that between sessions and making life changes, that’s a much more effective and cost effective and time effective way of doing therapy sessions in my opinion. What does an ideal, efficient therapy session look like for you? Ideally, I have materials prepared and ideas formulated as to what we will address in session. We check in regarding events of the week, anything specific the client would like to work on, and then tackle our collaborative goal for the session. We review at the end of session and agree on a task/homework for the client to work on prior to the next appointment. How do you know or measure how your clients feel about the sessions? In the past, I have checked in verbally and through formal assessments regarding progress. Recently, I’ve been using the feature in Therachat that asks for feedback on the last session. This is a way for my clients to share what was helpful so I can gauge what to do more of in future sessions. 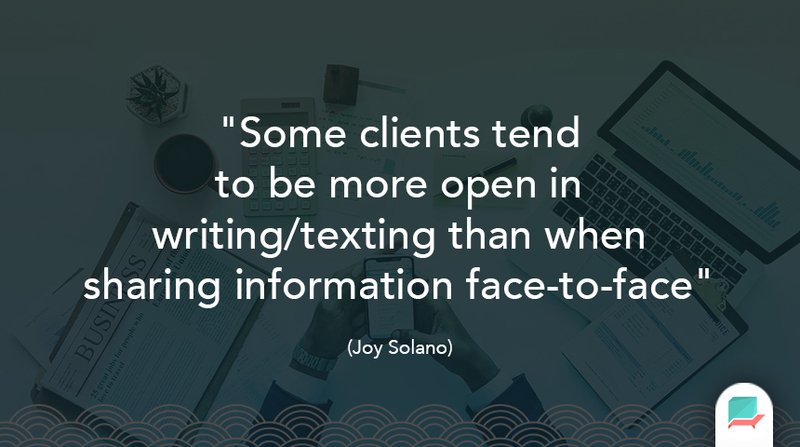 I’ve noticed that some clients tend to be more open in writing/texting than they may have the ability to be when sharing this information face-to-face. If you want to use the time as effectively as possible in a session, how does that influence your time outside of session? How do you prepare for sessions? I try to have an idea of planned interventions for the session in order to implement the individualized treatment plan and goals. I like to have any materials prepared prior to session in order to maximize face-to-face time with my clients. I can imagine that setting boundaries of how you spent your (unpaid) time outside of sessions is important. How do you keep control over the amount of time you spent outside of a session on clients? Great question. This is an area I continue to work on. Establishing boundaries is important to avoid burnout. I have struggled in the past to balance my personal life versus keeping up with session planning and required paperwork. It has helped me to set up pre-planned “work hours” to do my preparation and paperwork time. When the time is up, the time is up! 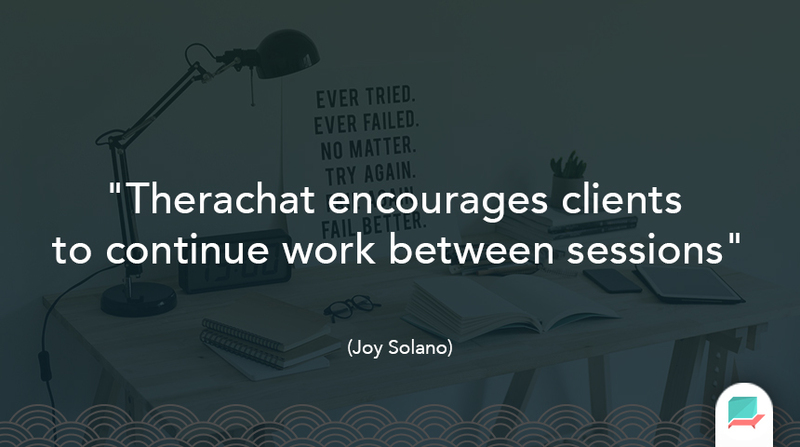 You talked about clients working hard in & outside of a session, let’s dive into that more. How do you help clients implement what they’ve learned in a session, outside of the sessions? How do you stimulate them to do so? I challenge my clients to practice what we talk about in session. Sometimes that may be sending them home with a worksheet or handout. Recently, I have been utilizing Therachat for activities such as posting links to articles or videos in Therachat and asking for feedback, asking a question for response, or sending a recurring prompt to remind to practice a skill. What do you mainly ask your clients to do in between sessions? Which kind of exercises do you give them? It really depends on what issues have brought my client to therapy. For people struggling with anxiety, it might be coping skills such as breathing, progressive muscle relaxation, or trying out a meditation app. For depression, I might focus on the self-care wheel, mood tracking, or examining unhelpful thoughts. For someone working through past trauma, I might challenge them to note triggers through journaling, practice relaxation skills, or read an article on shame. I also use the open journaling for all clients, as I think this can be helpful for anyone. How do you follow-up with clients on that work in between sessions, if at all? In the past, I have usually asked how the assignment went and discussed/reviewed any handouts that were brought back with the client. Therachat has given me more options for follow-up, because it allows me to see my clients’ responses to assignments, so I generally provide feedback on what I have reviewed. If assignments have not been completed, I will verbally review how the assignment went and discuss challenges that may have arisen. Either way, it provides a good chance to discuss treatment issues. 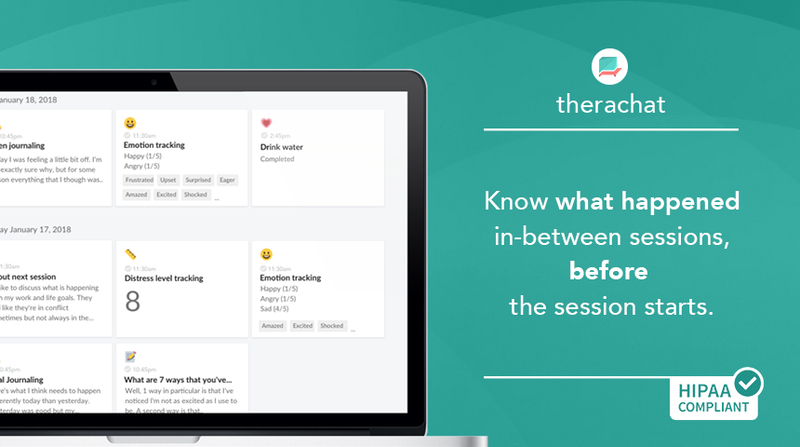 How does Therachat help you to have more effective therapy sessions? I am able to be more prepared if the client has given feedback as to what they want to discuss at next session. I’m able to take notes in session of any links or homework that is relevant to continuing the topic that was discussed in session. And it encourages clients to continue work between sessions. What is your favorite activity on Therachat to use with clients? Do you remember a specific moment where that activity was helpful? Well, the one that happened most recently that’s fresh in my mind is the person had asked for skills, like working on developing skills to manage depression and stress. So then I’m like “Okay, great.” So prior to that session, I was able to print out worksheets that I knew could be relevant and helpful, whereas a lot of times, I would have to use part of the session time to print out those because, well, yes, I do this routinely. If there’s a specific area that we’re working on, I don’t always have those prepared ahead of time. So that cue helped me be prepared ahead of time. I think it gave the client a better experience in session, at least that particular week. Not all of my clients have smartphones, so I still use my old methods with some. But the responses from clients who have used Therachat have been overwhelmingly positive. I have several clients who enjoy customizing their assignments in session. Lastly, what advice do you have for other clinicians interested in making their sessions more effective? Planning, reviewing treatment plans, checking in regularly with clients regarding progress and goals, and assignments for the client to complete between sessions – these are all techniques that are important to make sessions more effective. Incorporating newer technologies into therapy can be intimidating at first, but don’t be afraid to try. It is the direction of the future and people are constantly on their phones and using technology. Utilizing these tools can aid in psycho-education, skill practice, reminders, journaling, mood tracking, etc., all of which make sessions more effective. Thanks so much Joy, this was really inspiring! With Therachat, you know before a session start what to address and which skills to focus on. 7 Day Free Trial!